Wines of Great Britain Ltd (WineGB) is the national body for grape growers and winemakers. 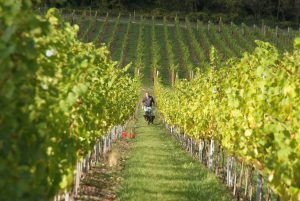 The original national body was established in 1967 by a handful of early vineyard pioneers, and was know as the English Vineyards Association (EVA). This evolved to become the United Kingdom Vineyards Association which in January 2017 celebrated its 50 year anniversary. Grape growing and winemaking in the UK has changed dramatically during over the last 50 years; England and Wales now have approximately 2500 hectares (6200 acres) of vineyards, with around 700 vineyards (of which about 540 are commercial), and over 160 wineries producing world-class internationally award winning sparkling, white, rose and red wines. The UK produced 5.9 million bottles in 2017. With this dramatic growth of the UK wine production industry Wines of Great Britain Ltd (WineGB) was formed on 1st September 2017 from the merger of the two previous bodies; United Kingdom Vineyards Association (UKVA) and English Wine Producers (EWP). This merger combined the resources, skills and expertise of both organisations to form a single and effective industry body to represent the grape growers and wine producers of Great Britain. WineGB’s mission is to advance the multiple interests of all is members to establish Great Britain as one of the world’s great quality wine regions. An extensive range of services and support for all members: a point of reference for information and advice; industry events; technical publications and updates, regular communications through bulletins, newsletters and an industry magazine plus a members’ only area on the website providing added resources and guidance. The guardian of the quality standards through the Protected Designation of Origin (PDO), Protected Geographical Indicator (PGI) and Varietal Wine Schemes. Wines of Great Britain is a company limited by guarantee and overseen by a Board of nine Directors. It employs a small executive team with a Chief Executive, Marketing Director, Membership & Operations Manager, Finance Officer and Marketing Assistant. The Regional Vineyard Associations are an important part of the industry structure and all members are also members of their regional association. WineGB is an independent, non-profit organisation financed by its members and seeks additional funding from industry sponsors.